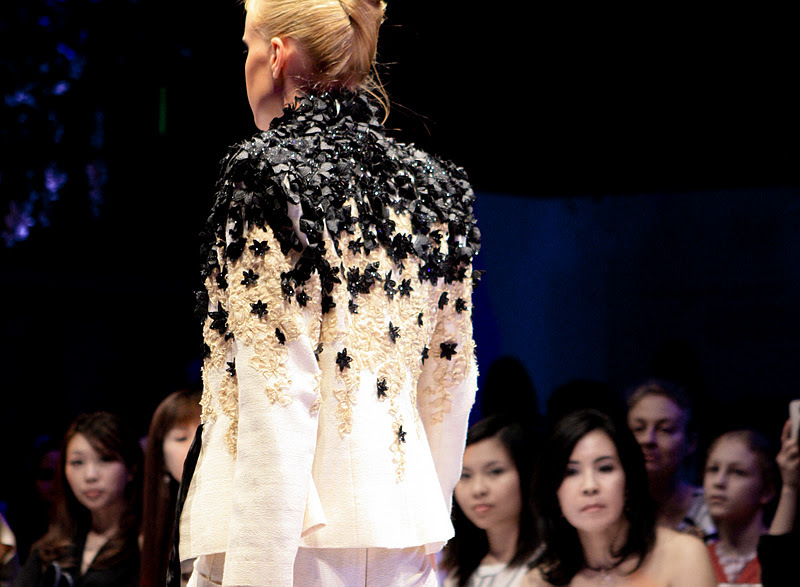 It's day 3 in Women's Fashion Week 2011, but Eymeric François is beeing the first show that I attended. I saw his designs online,but the real garment is soo much better, I was literally blown away. 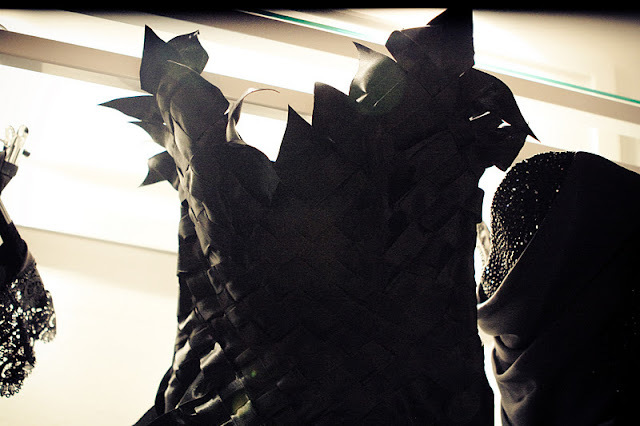 The BLACKOLLECTION is a compilation of his 32 couture creations over the years which dominant colour is black. With the thumping beat from gothic- alternative music, outfits are showcased on the runway one after another. He has been showing his couture collection in Paris since July 2000, after being assistant in fashion houses of Thierry Mugler and Christian Lacroix. He launched bridal collection in November 2008 and ready to wear in October 2010. His fashion show is a showcase where fairy tales become women’s reality. He plays with a lot of embellishment like embroidery, intricate lace, and crystals mostly on silk crepe, sateen, and wool. Models are sculpted in corset and gowns which show sensual silhouette. There is a sense of gothic inspiration married with the exquisite details, well-fitted and elegance of couture. Some of other outfits in his booth, and how amazing is the basket weave corset dress below?! Every piece is so exquisite and beautiful! These photos are amazing. I love all the lace details! So gorgeous. Thanks for sharing. these photos are pretty hot. 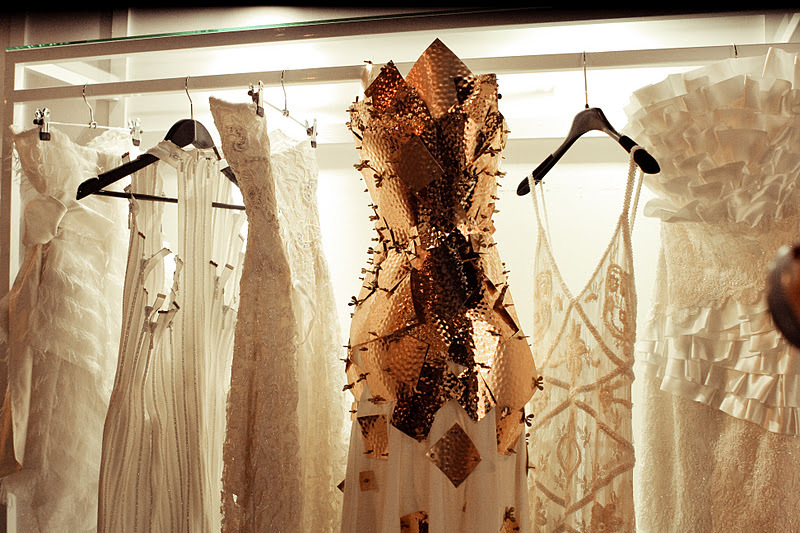 i love the lines and the detail in all the dresses! This collection is so great. Beautiful pieces. every single piece is to die for! love the drress n the last pic and the back details on the jacket! awesome! wow love the dresses! !i am a new fashion blogger from indonesia living in singapore :) i really like your blog. i will really appreciate & it will be an honor to have u as my blog member. all of the collection are great! OMG i love all the dresses and fenny pleaseeee aku kangen! Wow, such gorgeous designs - especially that first dress. These are beautiful! Especially the second one! I love this collection - the details are stunning! These shots are gorgeous and I love fashion, luxury brands. Your experience with fashion is so interesting coming from a perspective of modesty.